Lenticular printing technology : How does it work? To give you a better idea of what lenticular printing is all about and how it works, we will give you a small guided tour behind the scenes of lenticular printing technology. You’ll also find interesting information on lenticulartechnology.com. 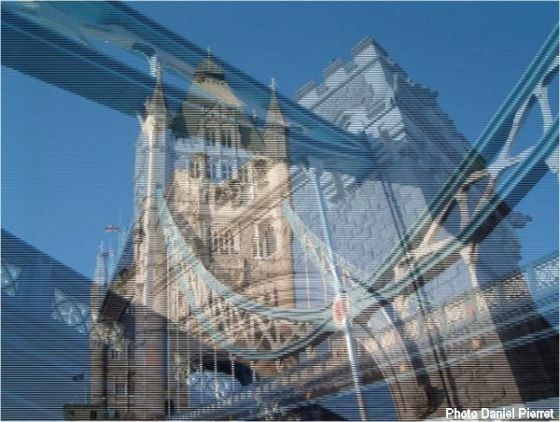 Lenticular print can best be described as a way to transform static print into a dynamic and interactive medium. The viewer is literally invited to participate in the experience. It is done by combining specially prepared – interlaced – graphics with a lenticular lens, and depending on the viewing angle, the viewer will see the different images appear. 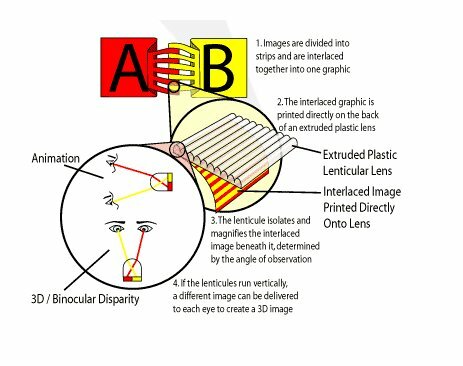 So, to create a lenticular image, you need a lenticular lens and at least 2 different images. Depending on the sort of animation you are looking for, more images can be used. But let’s not go too deep in the technology for now. The lenticular plastic sheet has one smooth side (this is the side you print on) while the other side is made of “lenticules”. These are the optical devices that will allow the effects to be seen. Each lenticule acts as a magnifying glass to enlarge and display the portion of the image below, depending of the viewing angle. Depending on the sort of animation and the printing process you will use to produce the lenticular prints, different lenticular lens designs exist. The thickness and viewing angle of the lenticules are different. You can find the specifications in the “products” section. A narrow angle will give an optimal lenticular 3D effect, where a wide angle will work best for an animation effect. 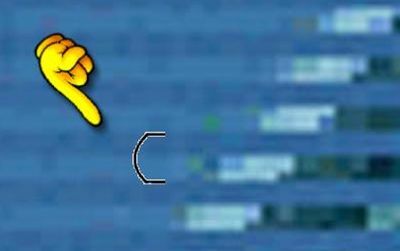 The lenticules for animation effects may run vertically or horizontally. However, you will see better results – meaning cleaner action and far less chances of ghosting – when the lenticules are in the horizontal direction. For larger, more stationary pieces such as a poster or P.O.P. display, the vertical direction should be used since it requires the viewer to move rather than the piece. How is the lenticular image created? Like explained before, you need at least two images. These images will be “interlaced” using Photoshop or a specific lenticular software. You will find more information about this in our section on lenticular software.eu. Interlacing means that the images are divided onto strips and are combined into one graphic (see illustration). Depending on the viewing angle, the lenticule isolates and magnifies only one of the two interlaced images. Hence the finished effect. To get the right visibility, the interlaced image will need to be “mirrored” before printing directly onto the backside of the lenticular plastic. Click here to know more about the prepress process.